We’ve all slammed the phone down in helpless fury after a Kafkaesque discussion with a council worker and sworn that we could run things a million times better if only we had the chance. A group of Preston residents did have the chance for the BBC’s The Street That Cut Everything. It’s hard to know where to start with everything that was wrong with this programme. It was intended to demonstrate what would happen if government cuts went further than they already have though I’m fairly sure we wouldn’t have Nick Robinson and the BBC sabotaging our efforts on a regular basis. The residents were thrown in at the deep end pretty early on when they woke up to find that their street had turned into fly-tipping central overnight, courtesy of the production team. 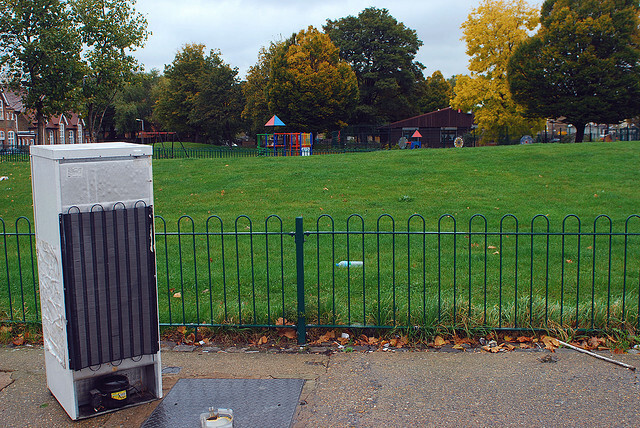 As anyone who has had to dispose of a fridge knows, all you have to do is leave it outside your house and some men in hoodies and a white van will steal it but social and environmental responsibility meant that this course of action was closed. As was the council-run tip. The obvious flaw is that realistically, only armageddon would result in all services being removed entirely, in which case we’d have more important things to worry about than whether our bins were collected. Like irradiated cockroaches. Or man-eating rats. Not satisfied with letting loose a team of researchers to turn the street unto an urban wasteland and taking their bins away, the BBC tested our suspension of disbelief some more through a series of euphemistically-named ‘challenges’ – switching off the street lights, graffiti-ing the place up and bringing in 20 dogs to foul the pavement. They also branched out into anti-social behaviour by bringing in some yoofs to surround an Audi playing loud music to demonstrate the lack of police services and council noise officers. This challenge failed on two counts; firstly that complaining to the police or the council about noise will get you precisely nowhere even when the services are in place and secondly that in real life the yoofs would have driven an Impreza Turbo, been armed with knives and kicked to a fine paste the resident who threatened to take a crowbar to their car. The big debate was around how their meager resources were allocated. Should they pool their council tax or keep it on a single household basis? Their initial decision to pool funds soon started to fall apart when it became obvious that some residents needed more help than others. It was also pretty obvious that no-one minded helping a deserving white-haired old lady with her shopping but were less interested in helping a single mother pick her daughter up from school. The production team must have been rubbing their hands with glee at having the opportunity to pit a single mother on benefits against a black man with no legs in a kind of benefit-off version of the X-Factor. Instead of an oaken-faced Simon Cowell, the contestants found themselves judged by a ring of disapproving neighbours who were clearly longing to go all Daily Mail on single mother Tracie. After a tense vote, she got her benefits but one resident was unable to restrain himself and launched into a tirade about how she shouldn’t have so many children (though I only counted two). By this time I was shouting at the TV and almost missed Tracie flinging her housing benefit back at them and stalking off with the parting shot that she was going to move house rather than live near them any more. It’s hard to know if the show actually achieved anything except to demonstrate that councils probably can run things better than a bunch of amateurs. The closing speeches from some of the residents were suspiciously upbeat and suggested that the experiment had bought them closer together as a community, utterly ignoring the shameful way Tracie was treated by her neighbours and the fact that several of them looked like they would rather scratch each other’s eyes out than have a cup of tea together. It all seemed rather sensationalist and pointless except to make everyone who works for a council unbearably smug in future.